It’s that time again. 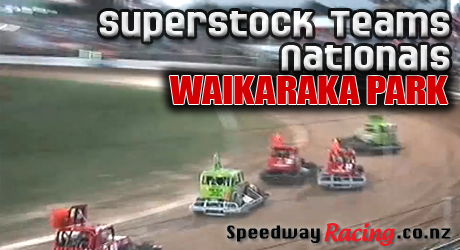 Superstock Teams Nationals on the 7th & 8th March 2014 at Waikaraka Family Speedway. Hell yeah! Superstock Teams Nationals. Yes. Superstock Teams Nationals. Friday night suport classes are saloons, six shooters, while Saturday night is the Auckland Modified Champs, plus stockcars, superstock consolation races, plus the $2,000 Superstock Dash for Cash as the last race of the night for Superstocks. Accommodation: If you need accommodation, check out some hotels nearby as ask on our Facebook page. Can’t make it? Watch the live stream just $25USD per night.